American law enforcement is a system in crisis. After explosive protests responding to police brutality and discrimination in Baltimore, Ferguson, and a long list of other cities, the vexing question of how to reform the police and curb misconduct stokes tempers and fears on both the right and left. In the midst of this fierce debate, however, most of us have taken for granted that innovative new technologies can only help. During the early 90s, in the wake of the infamous Rodney King beating, police leaders began looking to corporations and new technologies for help. 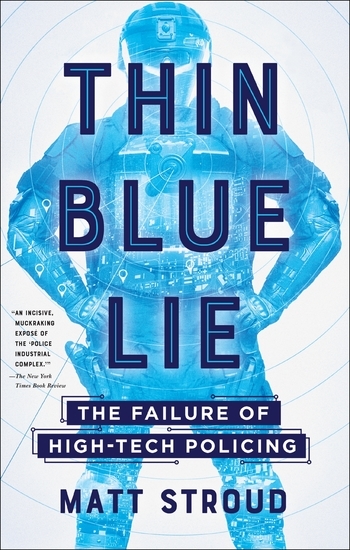 In the decades since, these technologies have—in theory—given police powerful, previously unthinkable faculties: the ability to incapacitate a suspect without firing a bullet (Tasers); the capacity to more efficiently assign officers to high-crime areas using computers (Compstat); and, with body cameras, a means of defending against accusations of misconduct. But in this vivid, deeply-reported book, Matt Stroud shows that these tools are overhyped and, in many cases, ineffective. Instead of wrestling with tough fundamental questions about their work, police leaders have looked to technology as a silver bullet and stood by as corporate interests have insinuated themselves ever deeper into the public institution of law enforcement. With a sweeping history of these changes, Thin Blue Lie is a must-read for anyone seeking to understand how policing became what it is today. Matt Stroud is an investigative reporter with a focus on companies that do business with police departments and prisons. Formerly on staff at the Associated Press, Bloomberg News, and The Verge, he has also written for publications such as The Atlantic, Politico, Buzzfeed, and The Intercept. Thin Blue Lie is his first book. Stroud lives in Pittsburgh, Pennsylvania.